Description This Port Wentworth, Georgia hotel has an outdoor pool, free internet access and free breakfast. Free breakfast free Wi-Fi and a seasonal outdoor pool help make the amenity-filled Holiday Inn Express Savannah North a smart choice for budget-minded travelers. The low-rise Holiday Inn features 82 rooms and suites with coffeemakers microwaves mini-fridges and flat-panel TVs with premium cable. 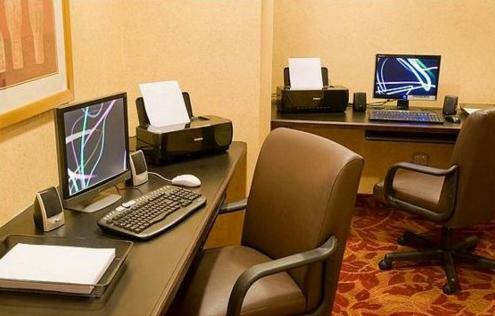 A business center located off the lobby offers fax and copy services and free Wi-Fi helps guests stay connected. Non-smoking and accessible rooms are also available. The complimentary hot breakfast bar gets the morning off to a fine start with signature cinnamon rolls eggs bacon and other tasty choices. In addition to the pool a 24-hour fitness room helps guests stay active on the road. The hotel also offers self-service laundry facilities. The Holiday Inn is off I-95 20 minutes from Savannah's historic River Street District where you can hop aboard a trolley and explore the waterfront restaurants and shops. The Georgia Tech Savannah Campus is three miles away and major corporate locations within 10 miles of the hotel include Georgia-Pacific Gulfstream Aerospace and International Paper. The Holiday Inn is seven miles from Savannah/Hilton Head International Airport. Add Holiday Inn Express Savannah North to your free online travel itinerary.